How high should a security camera be mounted? There is a practical answer to this question. It is recommended to install commercial security cameras between 8 and 9 feet off the ground. This provides plenty of distance between a potential intruder and the device, in order to prevent tampering or damage to the hardware. 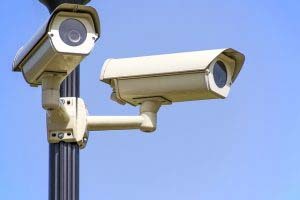 Do security cameras work without power? In most cases, security cameras and devices will not work during a power outage. However, some surveillance equipment comes with an internal battery. This typically comes at a higher cost, but it will result in continued security, even during a blackout. Do all security cameras require WiFi? Whether or not your commercial security system requires Wifi depends on both your budget and your needs. Using a digital video recorder (DVR) allows surveillance footage to be stored on a local area network, independent of a wifi connection. Alternatively, you could have your footage stored at an off-site location, requiring a Wifi or 3G/4G connection to a wireless network. How much does a commercial security system cost? Most companies offer different pricing models for commercial security services depending on the client’s needs. However, your average small business will pay between $300 and $500 per year to lease equipment, depending on the size of their business and on the number of devices needed for surveillance. Here at Iwatch security, we believe in establishing trust. This is why we offer a no obligation inspection, so we can show you what sets us apart from the national chain security companies. Please fill out the contact form below or call us today at 919-957-9818 to schedule your free consultation!